It’s every girl’s worst nightmare. Just a few weeks shy of my 39th birthday, trying to drift off to sleep, I was suddenly seized by a terrifying thought. “I have never porcini crusted anything.” Maybe porcini crusting went out of style with The Rachael haircut, but it’s still my idea of a fancy meal. And Valentine’s Day is coming up, so maybe you wanna’ get a little fancy? Porcinis remind me of wet leaves, red wine and cozy cloudy evenings. Their sensuous woodsy taste just oozes romance. They’re a little pricey, but dried ones aren’t too bad — I think one ounce set me back under four bucks at Whole Foods. You grind them up in the blender, mix with breadcrumbs and seasoning and voila! Delicious crust. Even though you might not make this recipe any day of the week (but you might), it isn’t difficult to do. My favorite part is that the accompanying Shallot Gravy is made with both the leftover marinate and the leftover crusting mixture. I served over Scallion Mashed Potatoes and Caramelized Beets. You can definitely have the whole menu done in an hour or so (not including marinating time). Here’s how: Marinate the tofu during the day. Then when you get home, first thing you do is prep the beets and get them in the oven. Then prepare the potatoes. Now prep the shallots (this is the hardest part! Shallots can be a real pain.) Blend the porcinis before blending the mashed potato ingredients so that you don’t have to wash the blender out. Now make the sauce, porcini crust and, finally, cook the tofu. That may sound confusing, but once you read through the recipes, you’ll get it. Ok let the romance begin! Slice the tofu into 8 even slices widthwise. Slice each of those diagonally corner to corner so that you have long triangles. Mix together marinade ingredients in a large bowl and marinate the tofu for at least an hour and up to 8 hours, turning when you can. When tofu is ready, prepare the crusting mixture. In a blender, pulse the porcinis until they’re powdery. Now toss them in a wide bowl along with the breadcrumbs, herbs, salt, pepper and garlic. Reserve 1/4 cup of the mixture to use in the sauce. Preheat a saucepan over medium heat and cook the shallots in oil until browned, about 8 minutes. Add the breadcrumb mixture and toss to coat. Now add the vegetable broth and marinade. Let cook until nicely thickened, 10 minutes or so. Taste for salt and pepper. Keep covered and warm until ready to serve. Preheat a large, heavy bottomed pan over medium high heat. In the meantime, dredge half the tofu slices in the breadcrumb mixture and place on a plate. Pour a thin layer of oil in the pan and cook the dredged tofu slices on each side for about 4 minutes each, until golden brown. Use a thin metal spatula (as thin as possible) so that you can easily get under the tofu to flip it. A thick spatula might cause the breading to fall off. While the first batch is cooking, dredge the second batch. Keep cooked tofu warm by placing on a plate and covering with tin foil. Serve over mashed potatoes smothered in gravy. Scatter a few roasted beets. Place a few slices of tofu on top and garnish with extra scallions (from the mashed potatoes) or whatever fresh herbs you can on hand. This looks soooo good! I can’t wait to make it myself. Thanks for sharing! Oh my! I’ve been searching for a new ‘fu recipe, and this might just be it! Fancy-pantsy!! I might just feel like a real foodie if I make this!! Pinned! looks fun im a bachelor wish me luck. and now I know how to press tofu, THANKS! How did you get the breadcrumbs to stick to the tofu so evenly and thickly? Any time I’ve tried to stick breadcrumbs on tofu, they mostly fall right back off (unless I use something like an egg wash, but that’s not listed in the ingredients). It’s just the moisture from the marinade. Normal breadcrumbs might not stick as well, but with the powdery porcini it works. Instead of eggwash I usually use a light coating of water and cornstarch. Works like a charm! this looks incredible! i’m going to make it next weekend…can’t wait. thank you for all your amazing recipes. you are a goddess! This looks so awesome! We love mushrooms at our house. My son has already requested that I use mushrooms again in this years Valentine dinner. Looks like I may have a new recipe to use this year. Woohoo! why don’t try to add some balsamic vinegarlike monari federzoni on top instead of red wine vinegar? I wanted something lighter, but whatever floats your mushroom! Ha! A way to sneak mushrooms onto my unsuspecting family’s plate! This looks absolutely divine! Fancy-town! I, too, have never porcini crusted anything. I might need to change that. I too have never tried porcini crusted anything,and i turn 39 on Superbowl Sunday!I will have to make this. Looks really good!Thanku for another great recipe!! LOVE IT. Totally making this for valentine’s. Never tried that whole porcini crusting technique on anything before…exciting!! Thanks so much! sorry for the stupid question, but the coating mixture says 1/4 cup of breadcrumbs plus a small amount of other ingredients, and then in the shallot gravy you say 1/4 cup of leftover breadcrumb mixture… is there a mistake in the measurements ? Eeks, I’m not sure what you mean! The breadcrumb mixture is the porcini powder and 1/4 cup breadcrumbs. Of that, you reserve 1/4 cup for the gravy. Does that make sense? YUMMY!!!! Looks absolutely delicious! I shall make this tonight and devour every drop! Have you ever tr ied Lobster Mushrooms???? They are amazing! They changed my life almost as much as VWV, Thanks for all your deliciousness and inspiration! Adding porcini mushrooms to my shopping list for tomorrow RIGHT NOW. The tofu was lovely, though my crust stuck to the pan, so wasn’t left with much on the tofu after wards !! Heck YEAH this is good. Way to go, Isa. 🙂 I’m eating it over brown basmati rice right now. I had to do half shallots half Vidalia since I underestimated how much “2 cups of shallots” would be when I bought the shallots, but it worked just fine. I also doubled all the garlic amounts (which is my standard practice) and I’d probably mince a clove or two in the marinade next time. This turned out freaking fantastic. My 2 y/o daughter was chanting “to-fu…to-fu” by the end of the meal! Hubs LOVED the gravy! Thanks Isa! Your two year old has refined taste buds! I made this — with lots of mistakes/changes as I did — but it was still delicious. I couldn’t get the topping to stick to the tofu, so I took the marinaded tofu and put it in a oven-dish with a bit of the marinade spooned over it and then pressed the bread/mushroom mixture on top. I then baked it at about 350 for 45 min. Also – I couldn’t get dried porcini’s so I used regular old non-dried white mushrooms, processed them up (possibly why I couldn’t make them stick to the tofu). The flavour was still fabulous, I can only imagine how amazing it must be with the real stuff. Perhaps my baking the tofu helped dry out the mushrooms a bit. Lastly – I totally messed up the gravy. I was making the mashed potatoes as suggested at the same time and got confused about what went where – so ended out blending the shallots with almond milk. Instead of freaking out (guests were coming in 20 min) I just added a bit of the marinade and the mushroom mixture and shoved the whole thing in the oven to get warm. It tasted great! This week I am going to make your recipe again and actually try to do it as written! Made this tonight… Served with fried potatoes and roasted asparagus… Simply amazing. I made this over the weekend. Absolutely delicious! My husband said it was as good as the meals we’ve gotten in some really good restaurants. We’ll definitely be making it again. Wondering if anyone has had success baking this and at what temp/time? One poster said she baked it but used a different type of mushroom. Anyone use the porcinis and baked it? I can never get my breading to stay on my tofu. It always ends up in the pan, thus my preference for baking breaded tofu. You should! I would do 425 to get them good and crispy. Maybe 10 minutes each side? Just keep a close eye after you flip em. I though you were serving it on a bed of mushy peas! It looks relish anyway! Made this last night. Yummy. I had a little bit of an issue with the breading sticking but i just scraped it off the pan with the tofu and put it on top. Some pieces came out great with the breading on. My little one came out and said it smells good and asked to try it. To my surprise he actually like it (5 yr old). I didn’t end up making the gravy because I had bought a package of mushroom gravy a few weeks ago and have been dying to try it. It was disgusting so I ended up drizzling some a’ oliver porcini olive oil on top and it accompanied the tofu so well. Really good recipe. Next time I am going to make the gravy! This seems like the best thing ever. I love shallots! This is, yet, another bangin’ recipe from our Miss Isa…my omni hubby (he’s really trying to eat healthy) said “Boy, this is good”. I just about fell out of my chair, until I tasted it as well, and: Boy this really is good..not just good, but DE-FREAKIN’-LISHOUS!! Well done, Miss Isa, and thank you VERY MUCH for sharing this recipe. You’re wonderful!!!! Isa, have you ever done this with tempeh? 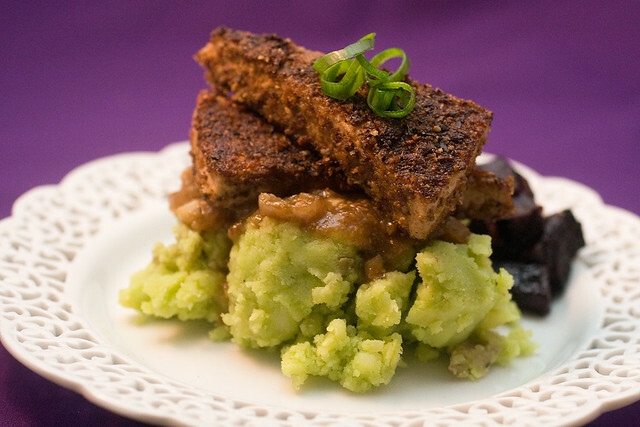 Like cooked the tempeh in the marinade, long and slow, then added the breading and continue with the recipe as is? It’s soooo good, and I just wonder if the tempeh would hold the breadcrumbs more easily. I would also love to marinate a big juicy portobello in this marinade and grill it.. Can’t wait for summer!!! This is my favorite recipe for preparing tofu, and I have tried many! I got the crust to stick!!!! I dunked the marinated tofu in AP flour, then in a mixture of almond mik and baking powder, then into the breadcrumb/porcini mixture….and it sticks!!! The only problem I could find is that I’ll have to double the breadcrumb/porcini mixture as the milk/baking pwdr mixture really soaks up the porcini mixture. Looks very simple recipe to make and must be delicious one. Thanks for sharing the each and every thing about the recipe how to make, I’m sure that it will be a easy task for me in this upcoming weekend. I meant to make this yesterday but didn’t have time, any thoughts on whether its still ok even after a night of marinating?? 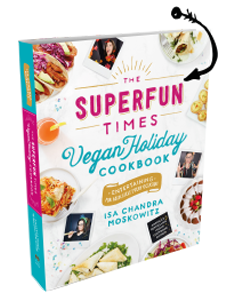 OMG…..I have tried freezing, thawing, pressing, marinating tofu before and I could rarely get the taste right…I am ashamed to say I made this recipe and ate all but one piece of the entire tofu block. So good. Is the 2 cups of shallots in the sauce accurate? That seems like a lot of shallot! This was amazing. It’s the first time I’ve made tofu so good I wanted to have some more even after we’d scarfed down every last piece, and that was with a bare minimum of an hour’s marinading time. The mushrooms were boletus mushrooms since I couldn’t locate porcini, and I sort of eyeballed the measurements which led to slightly loose mashed potatoes. I rechristened it potato-scallion purée and all was well. Delicious. Thank you. Could this be baked instead of fried? We’re eating Forks over Knives, so no oil! Any feedback on those who have baked this? Did it turn out crispy and yummy? Also, I find that the finer I grind my breading, the more likely it stays on the tofu. will panko bread crumbs work? They might be too coarse. I live in Japan, and I can’t get normal breadcrumbs – it’s all panko. Same with the mushrooms – the dried ones are pretty much all shiitake. Could I process the panko and shiitake together for this? Would it work? It looks delicious, and I make panko-crusted oven-fried tofu with koyadofu (that’s the freeze dried type) and it sticks to that fairly well as long as I bake it on a wire rack… I just wasn’t sure how it would work out with the mushroom pieces in there? Made this dish following the instructions and it turned out great, including breading sticking to the tofu (without any pre-dredge ritual.) I think it might be important to follow these cues from the recipe: 1) use all dry ingredients (except minced garlic) in the breading mixture; and 2) cook with oil over medium heat and use a thin metal spatula. Isa – the shallot gravy was great. Just a note, your ingredient list for gravy includes garlic, but the instructions don’t. I added it in with the liquids and it seemed to work well. I’m afraid I need to say something because someone could get poisoned by eating undercooked dried porcini mushrooms. I think I’ve read that mushrooms–but really especially certain fancy types–really have to be cooked THOROUGHLY to destroy toxins that can make people sick. Like actual toxins someone could get sick from, not just theoretical “toxins” like some people are concerned about in almost all foods. A while ago I even had a package of dried mushrooms–I think porcini–that had a warning on the package about using proper cooking time and technique. I don’t recall exactly what it said but think it was more cooking required than is used in this recipes, so I’m afraid this recipe could be unsafe. I’ve also worried people could get sick from the burgers from Isa Does It with dried mushrooms–like it might not be enough to just expect them to get fully cooked in the burger cooking. I don’t know. I’m sorry I don’t have more info and am not being clear. I’m scared and don’t want to cause harm, and I’m sorry I don’t know how. Please keep safe. Thank you so much for other recipes. I’m so sorry. Now I’m thinking I’ll cause harm if someone reads my previous comments and then deliberately decides to do something risky because I said something. I’m so sorry. Please keep safe. I’m so sorry for causing harm. Please don’t let me harm you, all. Please take good care. I wish I could offer all good safety to you.